When we began to uncover and sort out the way in which Local Motors would conceive, design, and build vehicles, there were many questions we developed as to how and in what order we would execute different steps. In many ways the creation of a car is simple: make a chassis, put on the axles, suspension, and wheels, drop in an engine, make a body, and put them together. VOILA. ....however layer on cost, availability, design constraints of style and performance, and suddenly even the way you put these steps together changes radically...and that is if you already know what it was going to look like in the end. Design everything for the first time, and it becomes a supreme game of tetris and an expensive one if you have to back up. 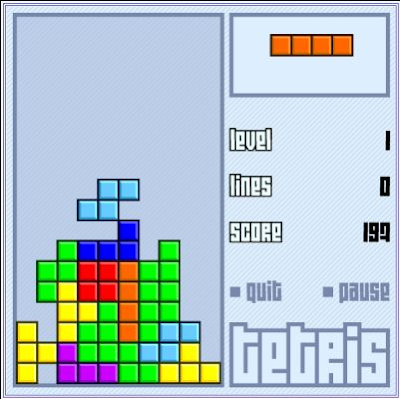 Because of this complexity, we have wanted to earn the right to push the Tetris pieces "back up the screen" and to start again with a different approach. The question is how to do this without great cost. Early on in our planning, we identified the need to build and test as much as possible in the digital realm before we began to commit $ to tools. Developing this ability would allow us to try out different configurations with much less fear of failure. It would give us FLEXIBILITY. Today we see the effects of one technique, built upon this ethos, beginning to bear fruit. 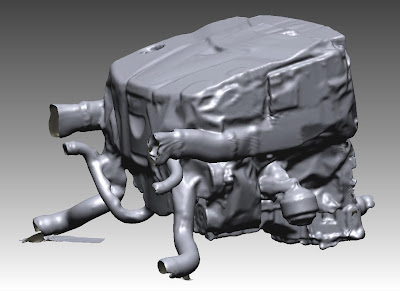 Several months ago, we began to train on 3D scanning in order to model suppliers' parts that we thought we might use. If this was successful, and that was a big "IF", we would be able to place parts together as if we were building to test for interferences and to build the entire vehicle more rapidly in a virtual world so that we could uncover and deconflict issues before it cost us a great deal of money. Drum Roll....... following is the recent scan of our engine system that Mike has spearheaded. Such a surface is an unbelievable representation of the data and allows us to work with a great deal of precision as we design. There is always a fine balance between investing up front to assure future flexibility, and over-spending for stuff you're not going to need. Figuring it out is an art, and often comes down to the experience and instincts of senior management. It seems like you aced this one. There is interesting reading around Real Options on one hand, and around the YAGNI principle the other hand. (You Aren't Gonna Need It).